What is the symbolic meaning of a coy fish? coy fish symbolism has gained strength over the centuries to encompass numerous positive qualities related to courage, overcoming adversity, the ability to attain the highest goals, and strong character. why many homeowners choose to incorporate them into their ponds. to create an eco-environment for your koi fish. for both the koi fish and plants. It will also help you to maintain your pond’s aesthetic appeal, as it will create a cleaner environment. A filtration system should include both a biological and a mechanical filter. of bacteria, so that it can remove the water’s excess nutrients. materials on the pond’s floor. By doing so, it will create a healthier environment for all organisms within the pond. by opting for solar power pumps and filters. The systems will be powered by natural sunlight, so it won’t cost you a penny to run a clean and healthy pond for your fish. problem in a pond, but they can actually do the opposite. to graze on the string algae and bottom feed along the pond’s floor. So, if you want to add a pond to your garden, you should ensure it’s bursting with life by adding plenty of fish. healthier environment for both your koi fish and the planet. For example, seasonal maintenance will require you to drain your pond completely. pond scraper, or you could use another algae removal device. Routine maintenance can be a lot less laborious than seasonal maintenance. and you’ll need to rinse both the biological and mechanical filter. You’ll also need to remove the pump for cleaning. and you should lubricate all gaskets. pump to stall or burn out, which can create unhealthy pond. should be free from harmful acetic acid and chlorine additives. Also, don’t forget to check its pipes and tubing for cracks, leaks, and weak spots. How much does it cost to build a koi pond? excavation, liner, filtration system, and simple rock border might cost $2,000 to $3,500. As a DIY project, the same pond might cost $500 to $1,000. Larger ponds, depending on features and equipment, can easily cost $5,000 to $15,000 or more. What is the minimum size for a koi pond? A pond for goldfish or water lilies need be only about 2 feet deep for zones 5 or greater. Ponds built in colder areas may need more depth to keep the pond from freezing solid. Ponds built for koi should be close to three feet or deeper to allow these larger fish enough space. How much space does a koi fish need? Koi should be stocked based on a reasonable estimate of their full growth, not on their size at purchase. Most well-maintained ponds will support 1″ of fish per ten gallons of water. Though some koi in the largest ponds will grow to 36″, we recommend using an average of 21″. Are koi hard to take care of? Koi grow quickly and get very large. Keep mature koi in an outdoor pond of at least 3 feet deep, with at least 50 gallons of water per fish. Young koi can be kept indoors in an aquarium of at least 29 gallons. Are koi carp easy to keep? Koi carp produce large amounts of waste, and so adequate filtration is a must in order to keep your fish happy and healthy. Koi carp are cold water fish, and do not generally require a heater in their pond, although if the weather is particularly cold for long periods of time, you may need to rethink this. How much space do koi need? Koi should be stocked based on a reasonable estimate of their full growth, not on their size at purchase. Most well-maintained ponds will support 1″ of fish per ten gallons of water. Though some koi in the largest ponds will grow to 36″, we recommend using an average of 21″. Are koi fish hard to keep? Koi are cold water pond fish, descended from carp. Koi owners may need to bring their prized koi indoors during the winter to prevent death in frozen pond water. Keep koi in large aquariums for a few months at a time. … That is possible, as long as you do not overcrowd the aquarium with too many koi. How big does a koi fish pond need to be? Well, at three feet deep, a six foot by eight foot pond will yield 1077 gallons. But these are merely the minimum recommended requirements. Also, the more fish you have, the larger your pond should be. A pond of the aforementioned size will be enough for no more than five average sized Koi. What do koi need in a pond? Simply put: koi eat some plants. A koi pond should also be larger because koi get quite large despite the size of the pond, it is recommended that a koi pond be no less than 1000 gallons in volume, the bigger the better. It also needs to have an area of the pond at least 3 feet deep, 4 – 5 may be better. How often should you feed koi fish? In much warmer water (76-82), three times per day is not “crazy,”‘ however, you have to be wary of bacterial blooms (cloudy water and low oxygen levels) if you feed heavy and there’s a lot of waste. Fish should be fed for about five minutes per feeding. koi fish yin yang and the koi symbol, and koi in feng shui. koi that have red colors are benigoi and for orange orenjie and this type of kois are mostly thrown in culling. Koi fish yin yang origin came from Taoism/Daoism, a Chinese religion, and a philosophy. The yin which is the dark swirl koi fish is associated with shadows, feminity, and through of a wave. Koi fish Yin and Yang have been for thousands of years already. I think way back as far as 700 B.C.E during I Ching the book of changes a text Universal in its understanding. It represents a dynamic balance of opposites and the process of unfolding events and change. 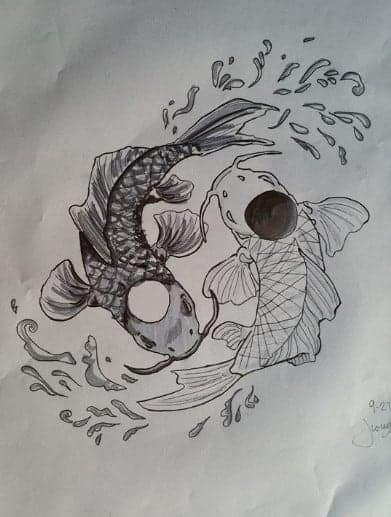 Koi fish yin yang are like two opposite yet complementary energies. night looks and is very different than a day but it is impossible to have one without each other, both create a totality a complete whole. koi fish color meaning koi fish colors have meanings it represents certain fortune and success in life. Kuchibeni is a type of Kohaku with red markings in their mouth that looks like they have lipstick Kuchibeni represents love and long lasting relationships. Yamabuki A Yambuki koi has golden bright colors and they are a symbol of riches and wealth. The koi fish is a symbol with extremely deep meaning for those who choose it as part of their body art. If you have been considering getting a tattoo that involves a koi fish, take the time first to learn the meaning associated with them. The traditional significance of a koi fish tattoo can vary depending on the fish’s orientation (whether it is going up or down your body) and color. You want to be sure that your koi fish tattoo conveys the desired meaning. A koi on a float during the Gion Festival in Kyoto representing the fish’s legendary struggle against all obstacles. Koi fish have a very long history in Chinese and Japanese culture. They were originally common carp and were later domesticated and bred to produce certain colors. Chinese invaders brought koi to Japan, where the fish flourished. Koi fish are prominent in the work of Japanese tattoo artists because of a long-standing legend of how the fish become dragons. Most of the meaning and symbolism behind the fish stems from this ancient legend. According to legend, any koi that is able to scale the waterfall known as “Dragon’s Gate” will be transformed into a dragon. According to Chinese and Japanese myth, there was once a giant school made up of thousands of koi fish swimming up the Yellow River in China. As they swam, they gained strength by pushing against the current. However, on the Yellow River, there is a waterfall. Once the fish reached the waterfall, most turned back and just went with the current because it became too hard. The ones who remained continued to try to reach the top of the waterfall. These koi kept trying for one hundred years. At last, one koi successfully leaped to the top of the waterfall. To reward this dedicated koi, the gods turned it into a beautiful golden dragon. The falls have become known as the “Dragon’s Gate.” And legend has it that to this day, any koi that has the strength and perseverance to complete to journey up Dragon’s Gate will become a heavenly dragon. It is also said that if a koi is caught, it will await the cut of the knife without a quiver with the bravery of a Samurai warrior facing the sword in battle. In Chinese and Japanese culture, the Koi fish has a deep history and symbolic meaning. They mark one of the rare instances of domesticated fish. Originally carp, they were bred for their rich colors. Some believe, however, that long ago, they descended from dragons. The story goes that once there was a huge school of fish made up of thousands of Koi swimming in the Yellow River in China. They went upriver, pushing against the current until they came to a waterfall. Many turned back, believing it was too difficult an obstacle. Some koi, however, kept trying and trying to jump over it. They kept at it for hundreds of years until finally, one koi made it to the top. To reward his persistence and bravery, the gods of the river turned that fish into a golden dragon. Today the waterfall is known as the dragon’s gate, and some believe that any fish that can jump it will still be transformed into a dragon. When a koi fish is caught, it will not flop and try to flee. With the bravery of a samurai, it awaits the inevitable blade that will take its life. Coupled with the ancient symbol of yin and yang—light and dark, balance in the universe—this tattoo is one of the most powerful and symbolic images known to man. People with this tattoo do not sit down and die, but remain persistent in all aspects of life. Win or lose, they stoically accept their fate as another turn of the wheel. 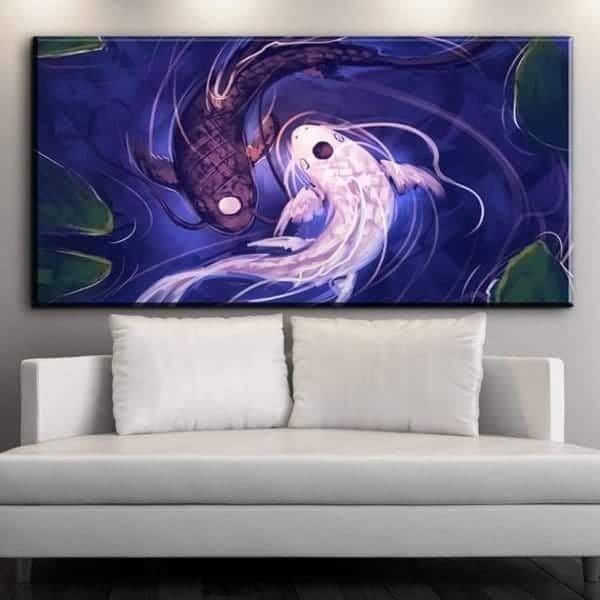 the koi fish yin yang symbolizes good luck, abundance, and perseverance. Symbolic in Buddhism is to represent courage. … Based on that legend, it became a symbol of worldly aspiration and advancement. In Japanese culture, the koi carp is a highly respected and very symbolic fish that is closely tied to the country’s national identity. The koi carp is thought to be a symbol of luck, prosperity, and good fortune within Japan. The name “koi” itself is Japanese and simply means “carp” in the Japanese language. 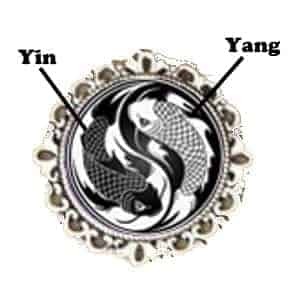 If you are bit scared in having a koi fish yin yang tattoo you might as well consider in wearing a koi fish yin yang necklace. We have koi fish yin yang necklace and earrings available for sale too. What is a koi fis yin yang and what does it mean? “Nishikigoi” is a general term for colored koi with markings which are bred for appreciation. Before the second world war, it used to be called “Colored koi”, “Flowery koi” “Figured koi” or “Fancy koi”. The word “koi” was first used about 2500 years ago in China. It was in 533 B.C. when Confucius son was born and was presented as a fish by King Shoko of Ro. The original home of the koi was said to be Persia. They were brought to Japan through China and Korea about 1000 years ago. They are work of Japanese art. The Doitsu is a kind of the Nishikigoi which has breed for food. Its origin was a black carp. In Japan a Nishikigoi and a Doitsu were crossbreeds and a colored Doitsu was born. women’s college, Who named the Nishikigoi “Living jewel” “National fish” was first used. In a photo album of the First All Nippon Nishikigoi Show in 1968. Mr. Hideo Miya of Ojiya was its inventor. The eye of each teardrop is symbolic of the constant watchful eye of the koi. This pairing of fish is often seen outside the context of the yin yang symbol as well. Yin-yang fish, a Taiwanese dish consists of a deep-fried whole fish that is still alive after cooking. It is also popular in China. Yin Yang fish, or dead-and-alive fish, originated in Taiwan. It is a dish which consists of a deep-fried whole fish (usually carp) that remains alive after cooking. The fish’s body is cooked while its head is wrapped in a wet cloth to keep it breathing. Fish. In Japan, fish that are prepared for sashimi while still alive are called “ikizukuri.” The fish is typically filleted without actually being killed and served while the heart is still beating and the mouth is still gasping. Can you eat fish alive? 11 Foods Eaten Alive That May Shock You. Those who enjoy eating meat, fish and poultry have made their peace with the fact that they’re eating animals, but few people eat them while they’re still alive and kicking. However, some dishes are actually meant to be enjoyed that way. Do Japanese eat live fish? Fish. In Japan, Ikizukuri (“prepared alive”) is the preparation of sashimi (“pierced food”) made from live seafood. The most popular sea animal used in ikizukuri is fish but octopus is the typically the only species that is still moving on the plate. Do Japanese eat raw fish? Sashimi: more than just raw fish. … Sushi needs no introduction these days, as the world discovers the pleasures of eating morsels of fish, most of it uncooked, on bite-sized patties of vinegared rice. But in Japan, raw fish is just as likely to be eaten without the rice — as sashimi. Is it bad to eat raw fish everyday? For most healthy people, eating reasonable amounts of raw seafood poses only a small health risk. Nonetheless, there is a risk for everyone. … One other safety tip of interest: If you do decide to eat raw fish, choose fish that has been previously frozen. That’s because freezing will kill any potential parasites present.